Oropharma Opti-Breed is a well-balanced blend of amino acids, vitamins, minerals, trace elements, Florastimul® and L-carnitine. This dietary supplement is administrated for good growth, optimal skeletal formation, good egg shell formation and perfect skin and feather structure. 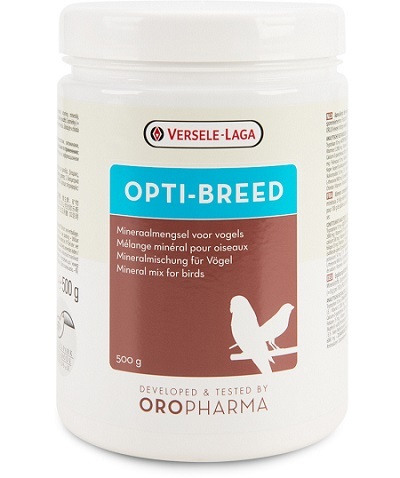 Opti-Breed supports general health and productivity and contains all the components your birds need for a good development. Adding Opti-Breed to your own eggfood blends ensures optimal breeding and growth. Florastimul® is a prebiotic, feed for good bacteria in the intestines. It supports the quality of the intestinal flora and ensures a good digestion. L-carnitine supports the growth of the chicks. L-carnitine also supports fat combustion, which results in greater availability of energy for physical exertion. 2 even measuring spoons (= 8 g) per 100 g ORLUX eggfood. During preparation for the breeding season (3 to 4 weeks before the first egg has been laid) and during the breeding season (from the hatching): add to the egg feed daily. Outside the breeding season: add to the egg food twice a week.